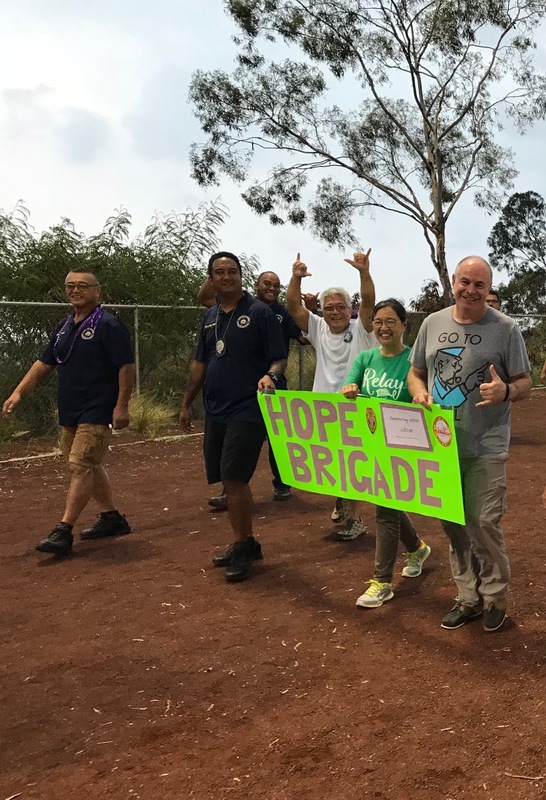 Kona Police partnered with the Kona Prosecutor’s Office to form a team named ‘Hope Brigade’ for Relay For Life 2018, which was held Saturday, (July 14), from 5:00 p.m. to 1:00 a.m.
Police Department participants included Captain Gilbert Gaspar, Sergeant Roylen Valera, William Vickery, Robin Crusat, Kuilee Dela Cruz, Reuben Pukahi, Chere Rae Kalili, Michael Abran and Evidence Custodian Fe Maura Pike. The event theme was ‘Konopoly’ (Monopoly themed), and the team booth featured baked goods, shaved ice and fried rice for sale by the Prosecutor’s Office, and Free Keiki ID’s and a Photo Booth from the Police Department. Community Police Officer Robin Crusat is a cancer survivor. This event celebrates victory for cancer survivors and also remembers those who may have lost their battle.